Taking control of your life means cutting through all the noise, finding emotional and physical balance, thinking more clearly, and advocating for yourself—Here's how to do it. Leslie and Josh came to therapy to talk about their son’s problems in school. But it soon became apparent that they had a different problem altogether—one common to working parents. Their daily routine included a dizzying array of activities and responsibilities that kept them constantly stressed. Getting their kids out the door to school was an ordeal, involving much haranguing and eating on the run. After working long hours, they arrived home to a laundry list of other duties. Constant interruptions from electronic devices made them feel on call to their workplaces and disengaged from each other. Though unhappy, they didn’t know what to do or how to make a change. As an experienced child and family psychologist (Anthony) and a management psychologist who works with business leaders (Paul), we were struck by how common these concerns are. We hear the same thing over and over from the people who come to see us: They feel overwhelmed by life. They struggle to make choices and decisions. They often feel stuck, adrift, or thwarted. For many of us, the pace of life has accelerated to a level where we can’t fully adapt. We exist in a buzz of worry that we’re not doing what we’re meant to do, and the anxiety we feel, in turn, makes it difficult to get things done, creating a spiral of inaction. What we need is more agency: the ability to cut through all of what pulls at us, find emotional and physical balance, think more clearly, and advocate for ourselves so we can take a course of action that makes sense. With agency, we can feel more in command of our lives. In our new book, The Power of Agency, we outline seven steps to creating more personal agency, so that you can put yourself on a more powerful path—whether at work, in your relationships, or in life in general. Here is what we recommend. Agency begins with what you let into your mind—meaning what comes in from your environment. If you are lacking agency, it’s likely your attention is being hijacked and you need to figure out how to restore it. For example, research has shown that having a phone present while you work distracts you and interferes with your capacity to think. On the other hand, taking a walk (especially outdoors) is a good way to restore depleted attention in your brain so you can concentrate better later. To help you increase your agency, practice going to quiet and screen-free spaces to escape overstimulation. That may mean spending time in nature, turning off your phone notifications while at work, or avoiding eating in loud cafeterias. It’s impossible not to be affected by those around us—it’s easy to “catch” their emotions, for example, and our brains tend to synch up when we associate with other people. That means you should set boundaries with difficult people, disentangle yourself from negative online interactions, and be more conscious of how you might be vulnerable to “groupthink”—pressures to behave or think in ways that are contrary to your values. Surround yourself with friends, family, and communities who encourage you to reach your full potential, nurture your talents, affirm your values. Instead, surround yourself with friends, family, and communities who encourage you to reach your full potential, nurture your talents, affirm your values and difficult decisions, and give you a reality check when you’ve behaved badly or are stuck in negative thinking. You can also get involved with your community through volunteering or just chatting with local merchants or neighbors. These positive social interactions will improve your state of mind and physical health, two critical building blocks of agency. Physical movement, along with proper rest and nutrition, puts your body and mind into balance, giving you greater motivation, strength, and stamina. Research has shown that sitting a lot is dangerous for your health, and that even short breaks from concentrated periods of inactivity—like getting up to stretch or walking around the block—are good for you. Studies also suggest that exercise can lead to greater self-control—the ability to defer gratification, which is key to agency. If you’re in deep at work, set a timer to go off every hour and remind yourself to take a moment to assess your mood. If you’re feeling stuck or overwhelmed, get up and move. And, if you’re having any issues at work, discussing them in a walking meeting (instead of a sitting meeting) may help mitigate conflicts. People with high levels of agency are continually learning more and expanding their capacity to learn by adopting a more open, collaborative approach to everything in life. This requires nurturing your curiosity and allowing yourself to explore new ideas, skills, and people. You can take an interesting class, explore your world kinetically (through your hands or body), or spend time playing or using your imagination. Or you can learn from other people by staying curious and asking them open-ended questions, listening to gain understanding, and avoiding any quick judgments. This isn’t always easy. Practicing a growth mindset—where you recognize that you are a work in progress, capable of learning and changing—can help combat the fear of failure or judgment that often come with learning new things. 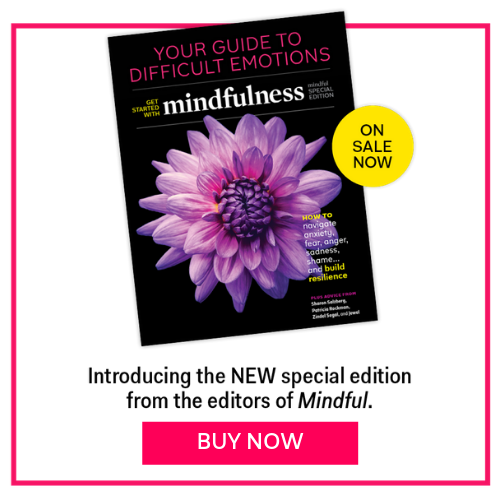 If you have trouble letting go of perfectionism, it might help to practice mindfulness meditation, which has been shown to reduce self-judgment, or use cognitive-behavioral therapy techniques that help put mistakes in perspective. Too often, we operate from unconscious beliefs—I’m too old to learn a new job skill or No one will ever want to be in a relationship with me—without being aware of how they thwart us from even trying certain things. When we are driven by unconscious emotions like fear, sadness, or worry, it can lower our energy and make us feel doomed or overwhelmed, which also hurts our agency. Increasing your awareness of how your emotions and beliefs drive your thinking, influence your behavior, and affect your judgment will help you navigate life with greater confidence. While uncovering these inner thoughts and emotions may take effort, being more self-reflective helps you keep grounded by slowing down your thinking process. For example, try to catch yourself the next time you feel angry with yourself. Don’t automatically accept that harmful emotion or, worse, dwell on it. Instead, pause and question it. Why am I feeling this way? Am I pressuring myself too much? Maybe my beliefs and expectations need some adjusting. Start by slowing your thinking down. Take slow deep breaths. Take yourself to a quiet place. Consciously let go of the tension building up in your muscles. These simple techniques will relax you and keep you more self-aware. This enhances your agency by putting you more in charge of what you feel and think. Don’t automatically accept that harmful emotion or, worse, dwell on it. Instead, pause and question it. By learning how to recognize our inner emotions and thoughts, name them, and let them pass through us, we can practice more self-control, which also helps build greater agency. Think of intuition as deep inner knowledge that is comprised of millions of data points that our brains have observed over the course of our lives. When used wisely, it can be a tremendous boost to our creativity and help us make important decisions, thereby increasing our level of agency. Many of us are familiar with visceral, gut feelings about people or things—such as when you meet a new boss and sense right away that he’s bad news. When you’re in situations involving unclear social demands with few clues to navigate them, this type of intuition can be useful to you. However, you must be careful not to confuse intuition with bias and prejudice. In situations where emotions are running high—like during a job interview or when swiping on Tinder, for example—it’s best to slow down, take a breath, check in with others, and get more information rather than relying exclusively on quick, automatic impressions. Strategic intuition, a second type of intuition, is more intentional. For example, you decide to stop thinking about a particularly vexing problem at work and—while on a long run, in the shower, or after meditating—a solution avails itself. Finally, “expert” intuition happens after long periods, sometimes years, of practice at a particular skill. Here, less conscious parts of your brain are able to take over, provided you stay calm. Think of a pilot handling an emergency landing who allows their mind and body to perform as needed, without consciously thinking through each and every step. You can get better at using intuition to inform your decision-making if you learn to quiet your mind, develop a greater awareness of what you’re thinking and feeling, and listen to your body. People with low agency experience common impediments when trying to make sound decisions. They may procrastinate, obsess over details, or worry excessively during the process; they may lack confidence and be risk-averse; or their thinking may be too fast and they act on impulse. When making an important decision, like where to move or how to advance your career, it’s helpful to stop and deliberate first. Put yourself in an environment conducive to reflection and exploration, and make sure you have time and your emotions are calm. Then, focus on the issue at hand enough to clarify your primary objective and what is at stake. Asking open-ended questions and gathering pertinent facts also helps. It’s good to generate lots of options at first, making sure that any strong emotions or biases aren’t driving your thoughts. Then, you can draft a plan for yourself based on those options, putting your thoughts and decisions into writing. The plan should simplify your options and incorporate the most important facts. At this point, let your mind rest and allow any intuition to rise to the surface. Set your plan aside and come back a while later to reassess it, making changes as necessary. Remember, taking action doesn’t require 100 percent certainty. Higher-agency people will start to act if they are 80 percent sure or more. So, don’t over-deliberate before acting. You can always reassess later if need be. Having more agency means taking responsibility for your life. The next time you sense something happening around you—or within you—that doesn’t feel quite right, don’t ignore it and reflexively press on. Exercise the discipline to stop, pay attention, and work on finding a better path for yourself. By practicing more agency, you’ll have more influence over your life and greater impact on the lives of others. Anthony Rao, Ph.D., is a nationally-known child psychologist, who currently consults with parents and educators on helping young people address modern challenges. For over 20 years, he was a psychologist at Boston’s Children’s Hospital and an instructor at Harvard Medical School, and his work has been featured in several publications and news programs. He is the co-author of The Power of Agency: The 7 Principles to Conquer Obstacles, Make Effective Decisions & Create a Life on Your Own Terms and The Way of Boys: Promoting the Social and Emotional Development of Young Boys.